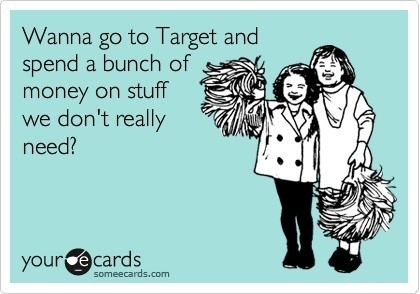 We didn’t make it to Target, but that was only because we ran outta time. 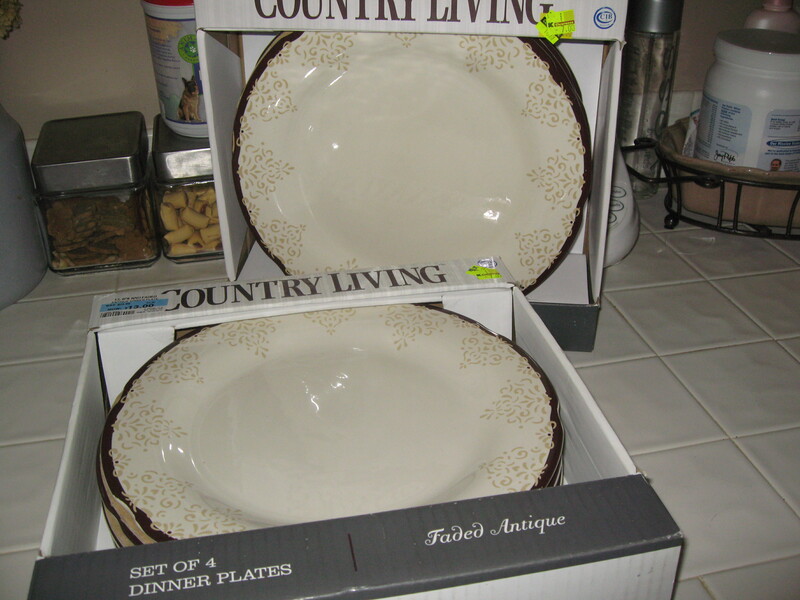 We went to K-Mart and I picked up some new dishes. On sale for only $7.00! And I like them! I need to go to Target for matching brown bowls and small plates now. Next we headed to World Market. A dangerous place for sure! 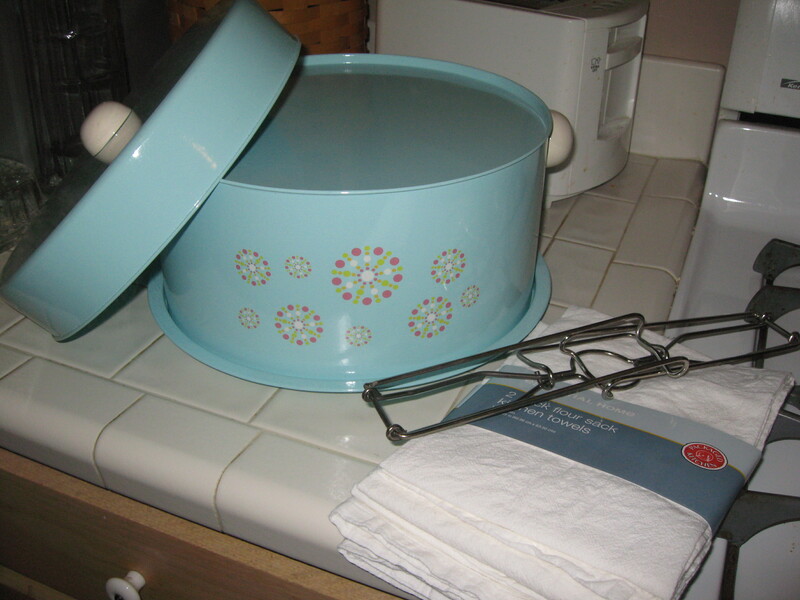 Just look at this adorable vintage like cake carrier we came across. It’s tin and it’s in the robins egg blue…love it! I picked up the tea towels at K-Mart too . 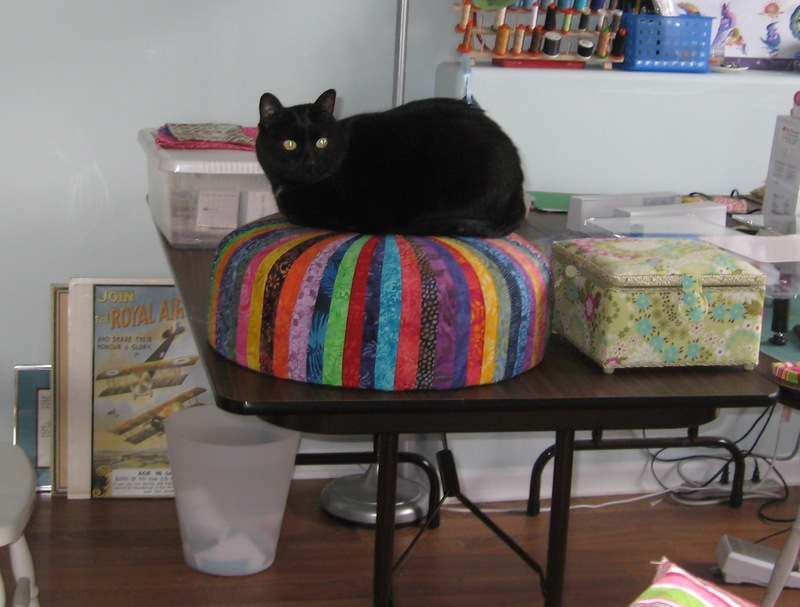 I could add an embroidery design and display them with the cake carrier. 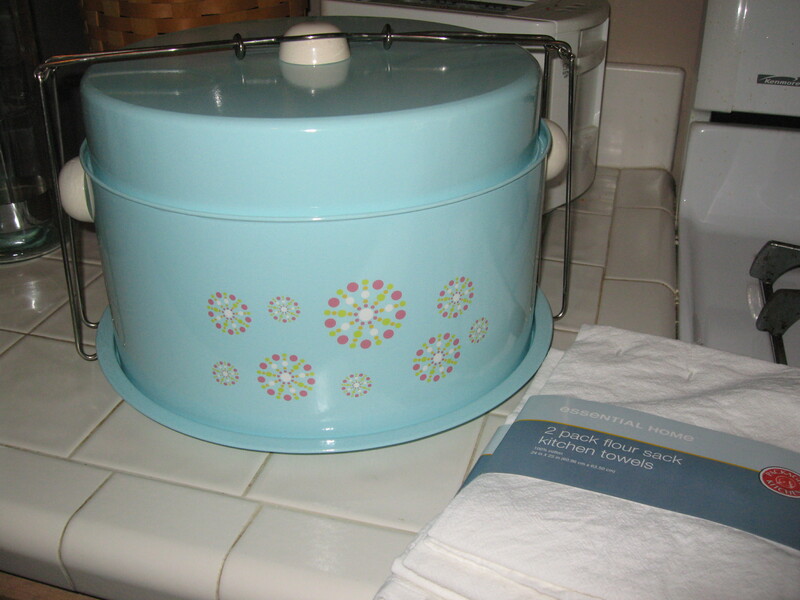 It even has a removable top for a pie…I’m actually giddy over this find! 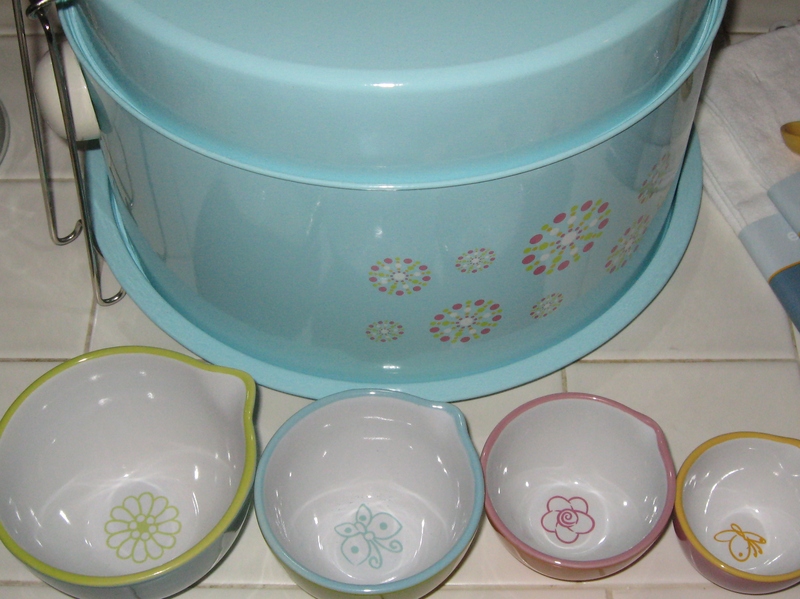 I love pretty much anything for the kitchen, so these cute nesting measurement bowls jumped into my basket as well. Each one has a different design in the bottom. 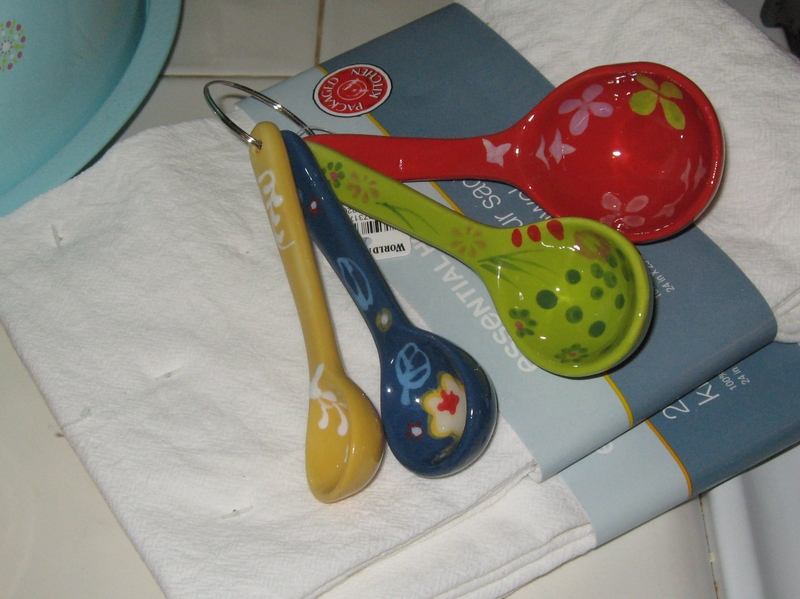 The ceramic measuring spoons came home with me too. 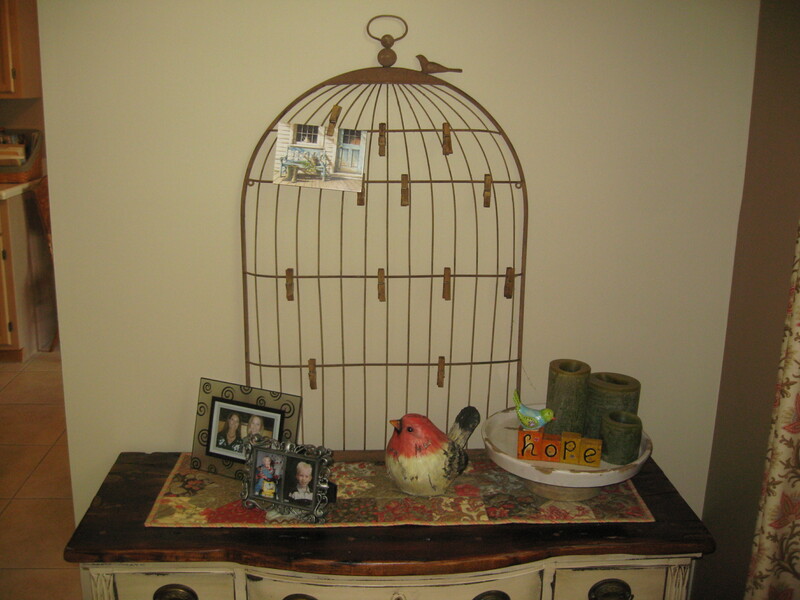 Check out this awesome vintage looking bird cage wall hanging that holds photos or post cards. Mine now:) That’s the perfect spot for it. 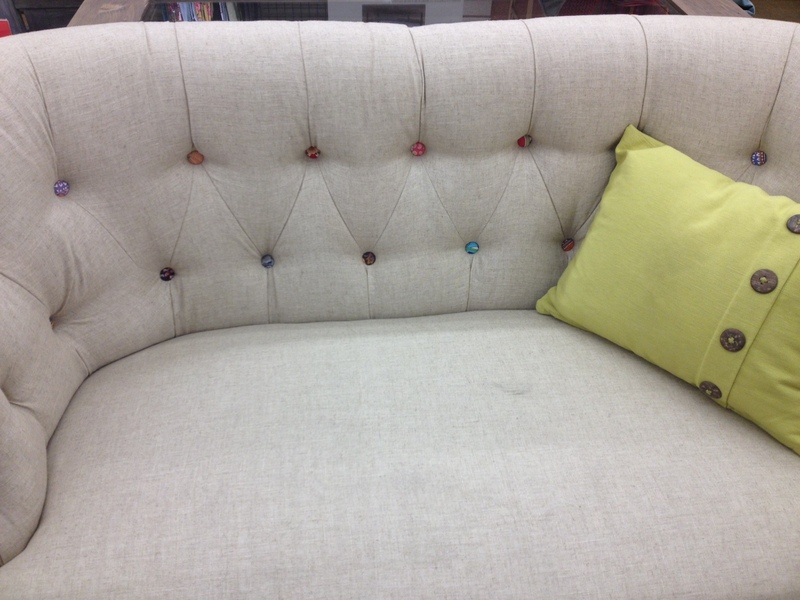 A cute sitting chair in a linen fabric and each button was a different fabric. 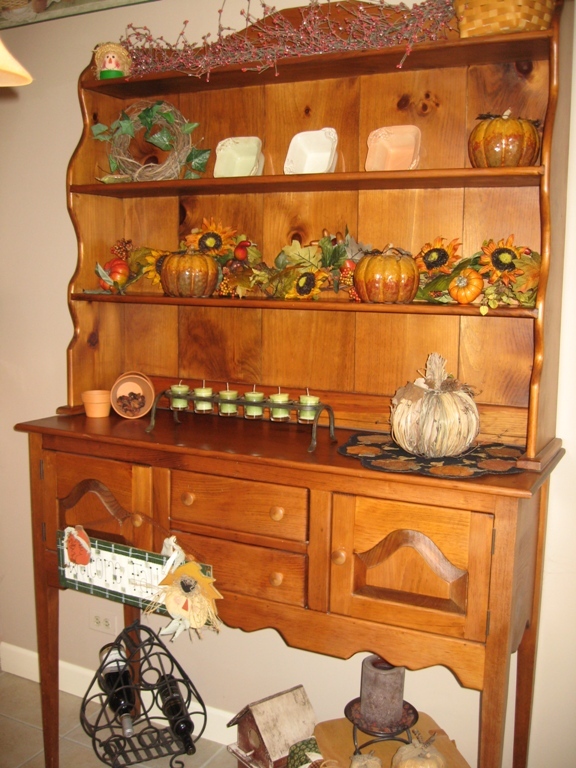 So cute and I wish I had a place for this. I don’t, so it had to stay at World Market even though I know it wanted to come home with me. 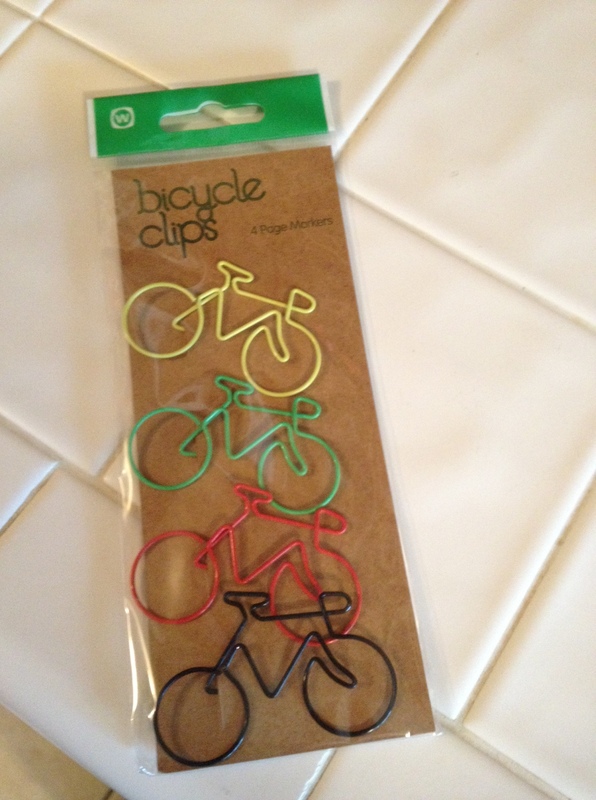 I picked up these bicycle paper clips for me and my friend Vicki, who also has a love for cute bicycles. 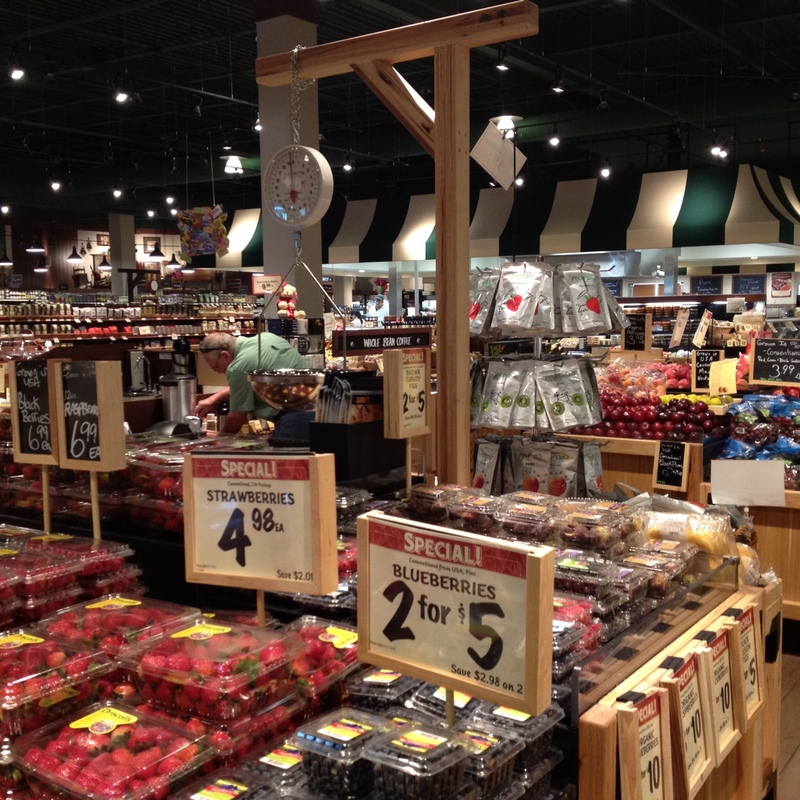 We stopped by our favorite grocery store…The Fresh Market. 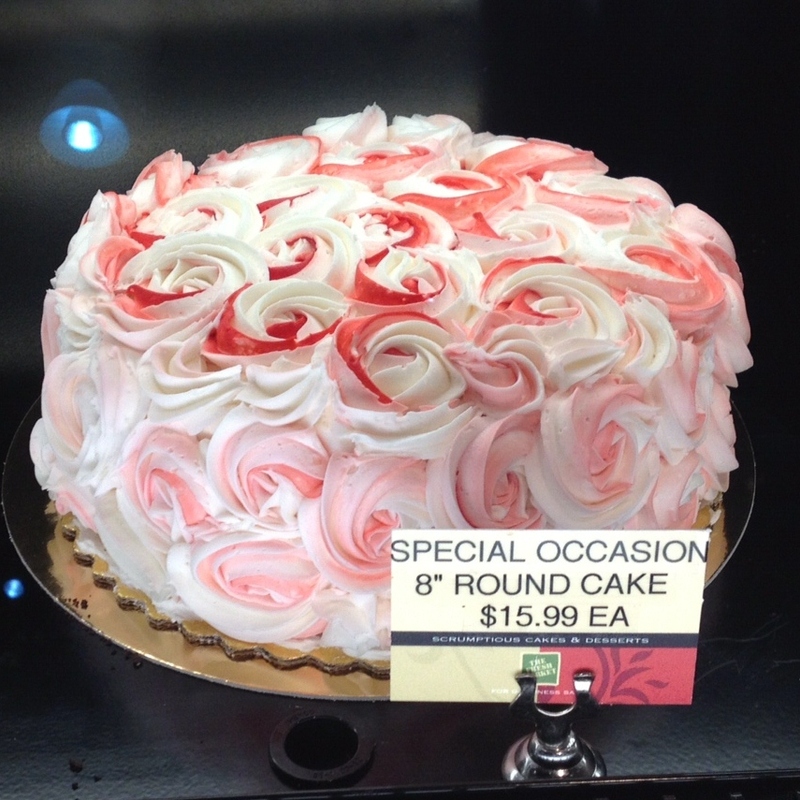 Lots of goodies to keep you…um …healthy;) Isn’t this cake beautiful? This did not come home with me. Unless having my teen away for the week counts as a special occasion…hmmm. Even though work was a distant second today, it was still in my thoughts. 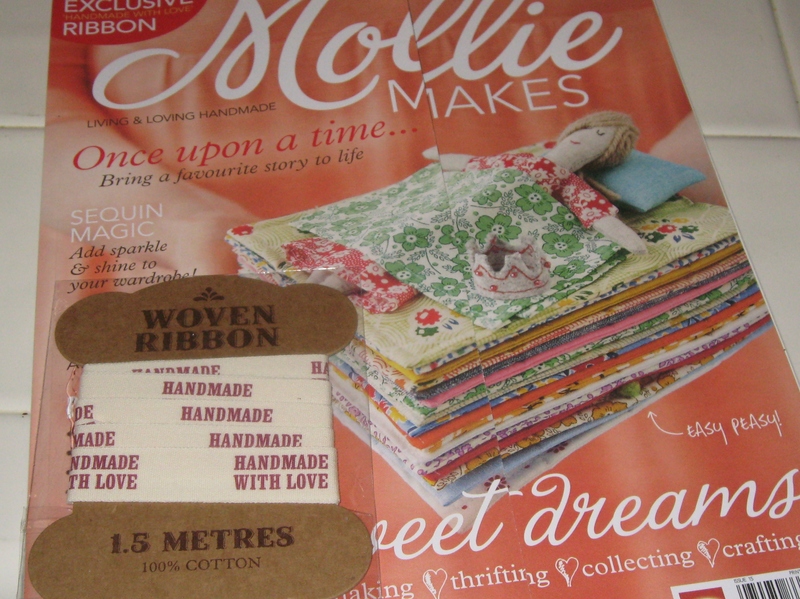 I managed to find the new issue of Mollie Makes. Thanks for letting me brag about all of my great finds. I hope everyone enjoys their weekend! I still am unable to sew or do much handwork, so I thought I’d share some pics from fall and Halloween projects this week. 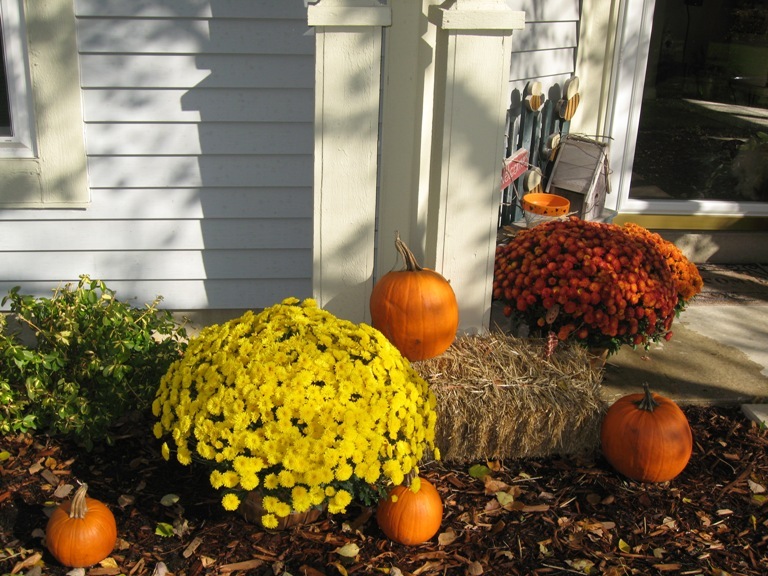 I love Fall and Halloween for many reasons..
Chill in the air, listening to the leaves dance outside and all the changing colors we are so lucky to see up here. This pic is the pond in our backyard. I was lucky enough to find the perfect day for the reflection of the trees. I wasn’t the only one out there taking pics that day. It was beautiful! 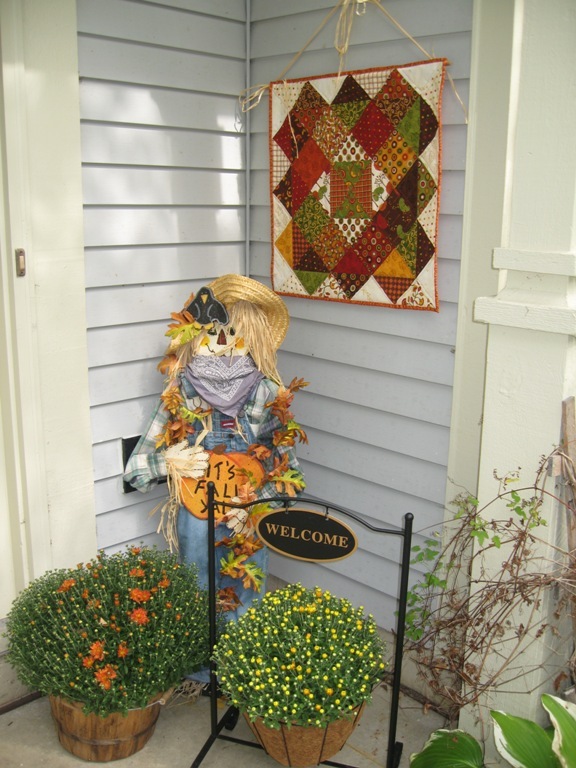 I decorate my front porch every year with this cute scarecrow I made after I first moved here and our local nursery grows their own mums. When I drive by and see the baby mums growing, that’s the 1st sign fall’s on it’s way. I made that cute wall hanging too. It’s a perfect fit! 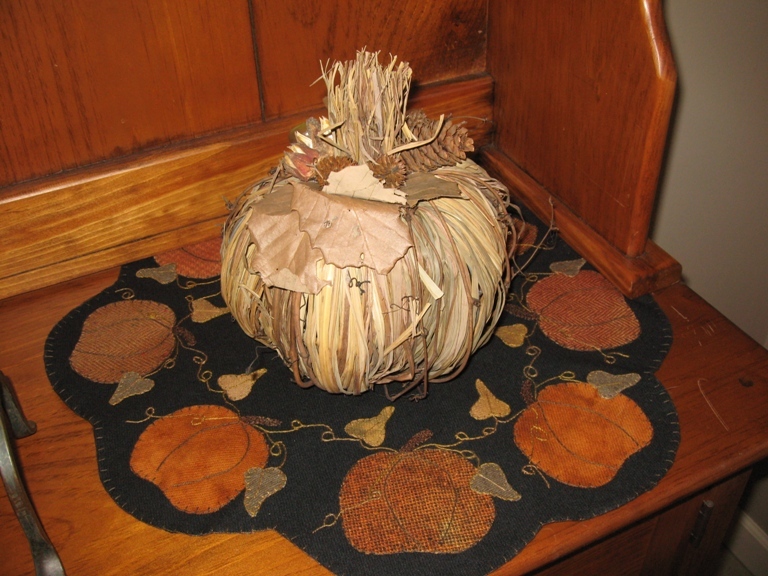 I take down all of my normal decor in the kitchen and replace it with fun fall things like pumpkins, fall vines and wool mats. 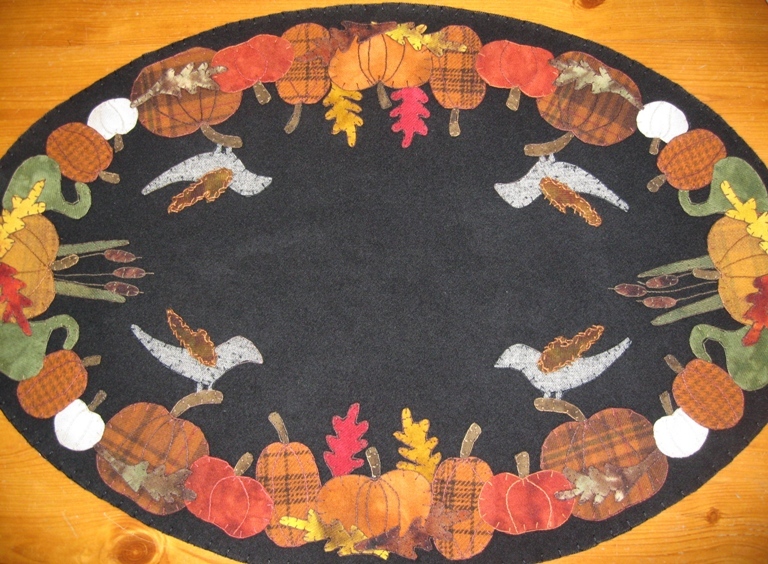 And here’s the 2 wool table mats my mom made me…love these! 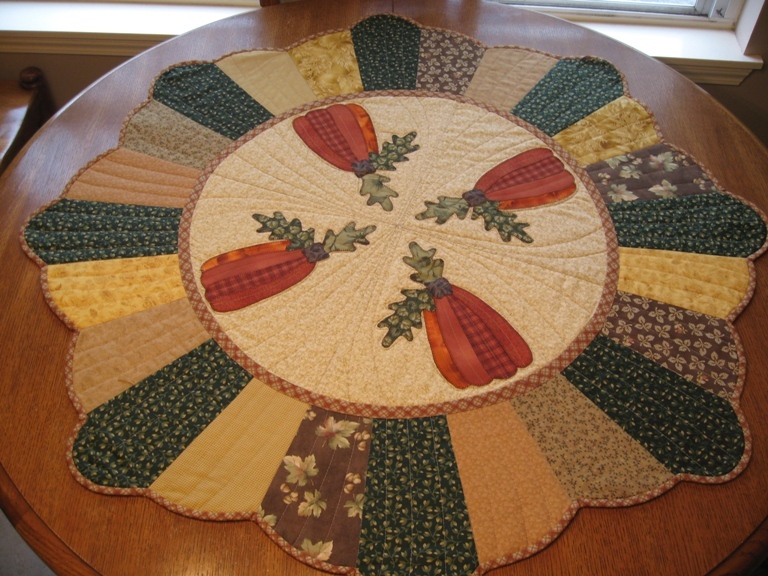 And last is the table topper I made for my kitchen table. 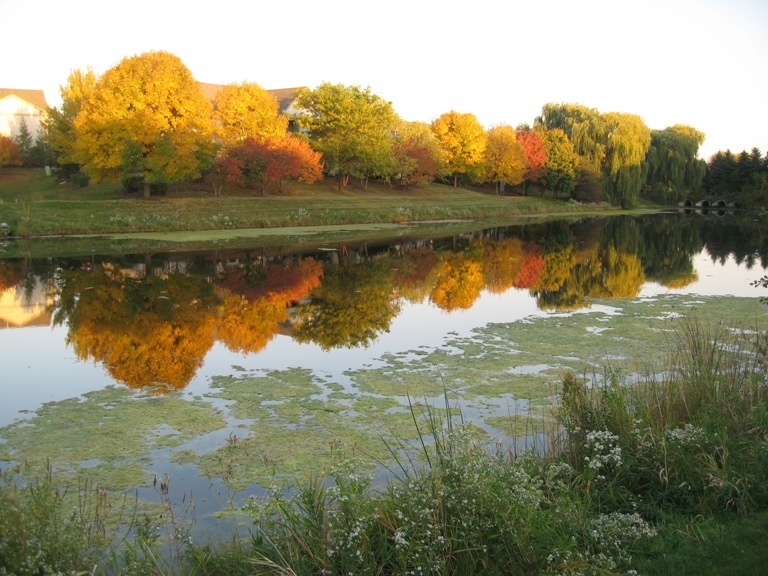 Try to take a walk today and enjoy the fall weather. It won’t be around for long! As promised I’m back with the results from mine & Daisy’s stroll. 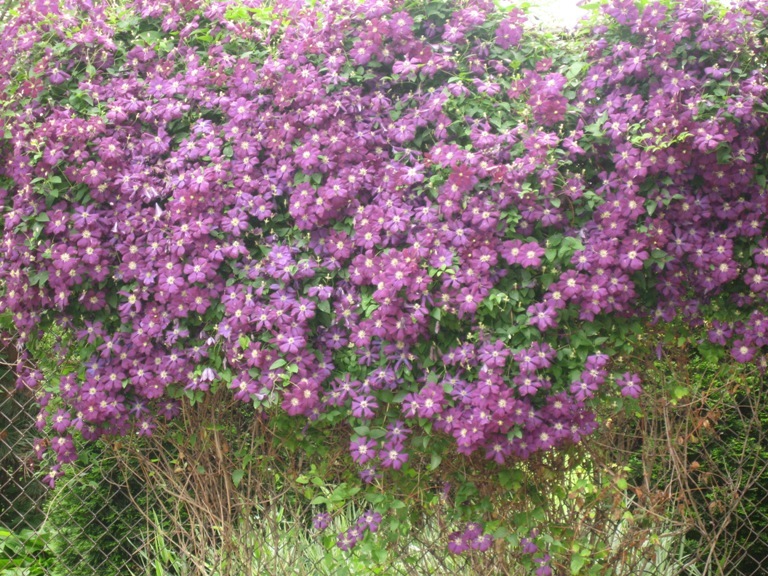 Here is my neighbor, Gloria’s, flowers. 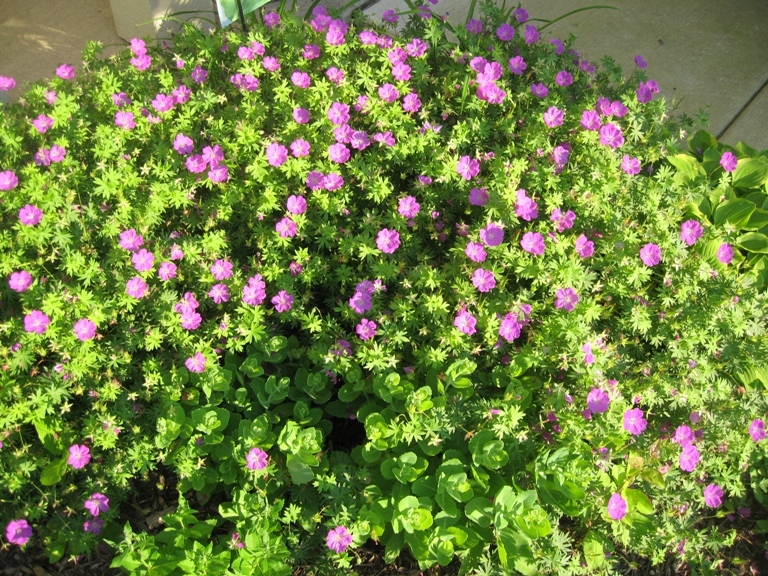 Baskets of Geraniums and Cranesbill Geranium ground cover. My flowers aren’t so impressive yet. July/August seems to be my best bloomers. 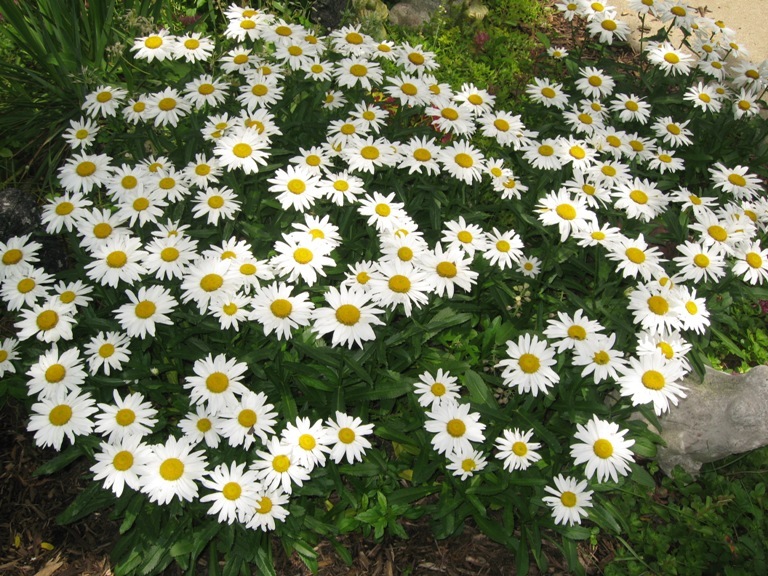 Daisies, Cone flowers, Daylilies, and last year my Impatiens were a whopping 30″ tall. So, we’ll have to wait for mine to catch up. 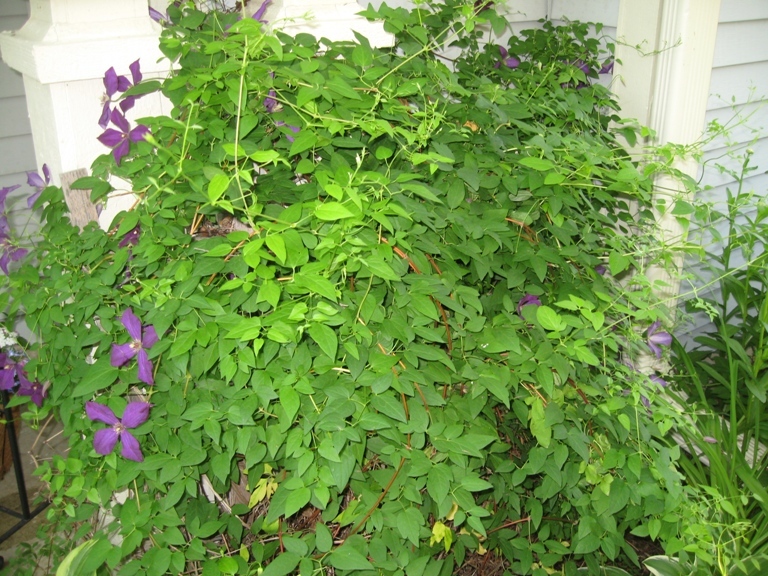 This is my Clematis. 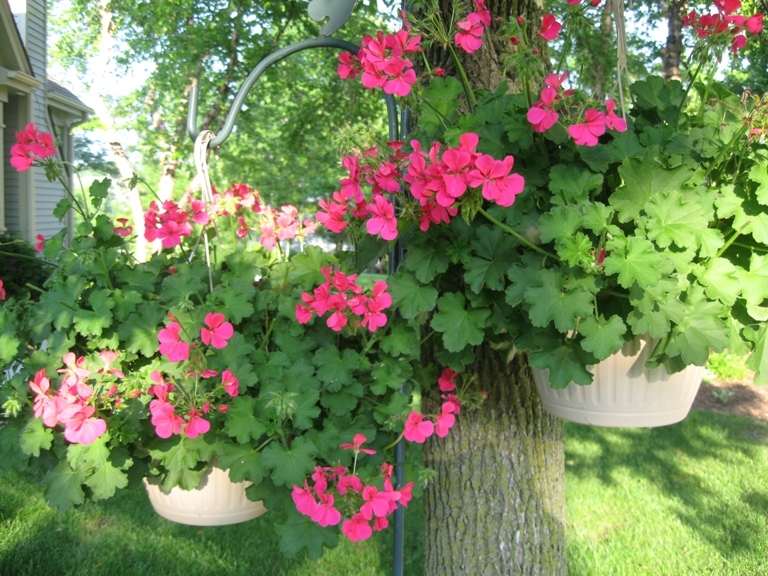 Pretty decent this year but not loaded with blooms. Why? Too much shade maybe? This is one not too far from my house…beautiful. 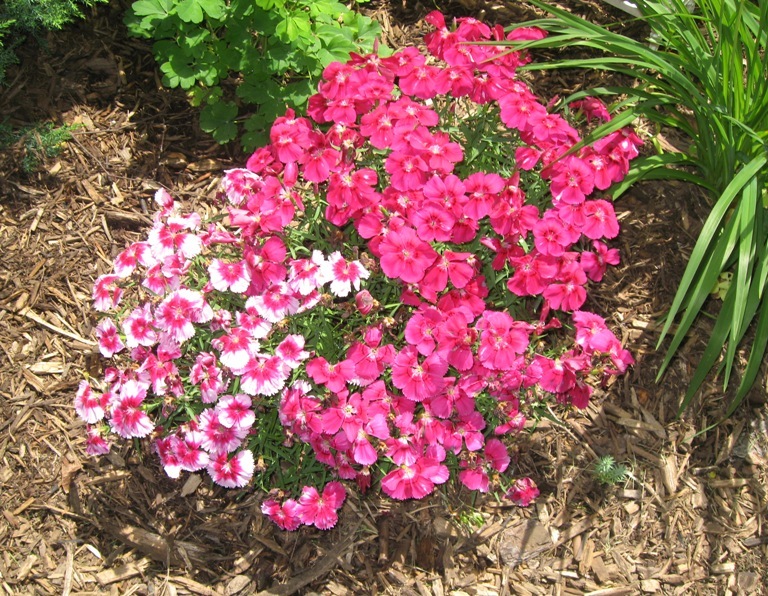 Daisies and I can never remember the name of the hot pink ones… Coreopsis maybe? 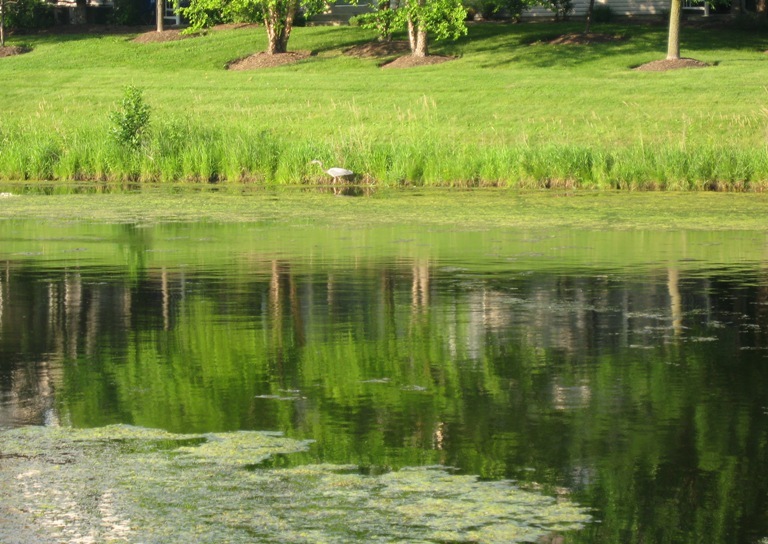 I visited the pond and saw this crane across the way. 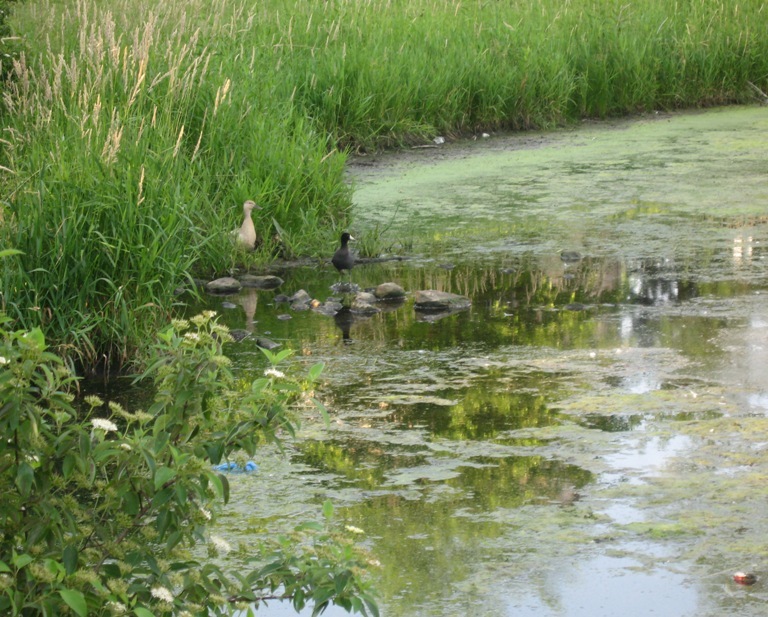 And a mamma and daddy duckie protecting their babies. You can barely see them..I didn’t want to get too close. 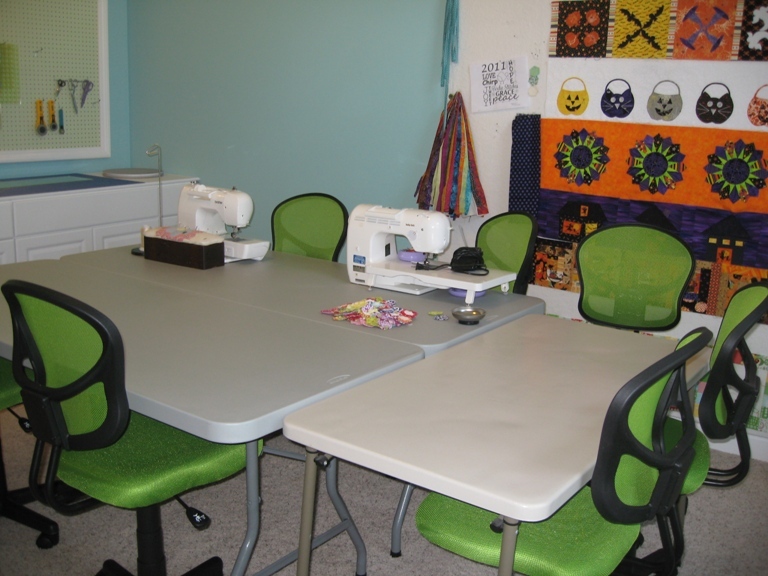 A place for friends to gather and to work on projects. Relax, have a drink, learn something new, and show off your latest project. 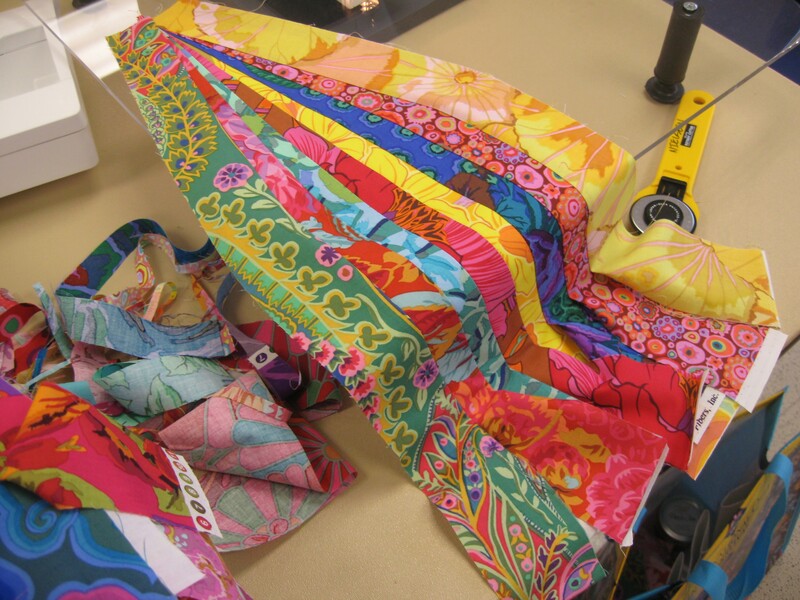 We started with our inspiration….the colors in our logo, robins egg blue and chartreuse green. 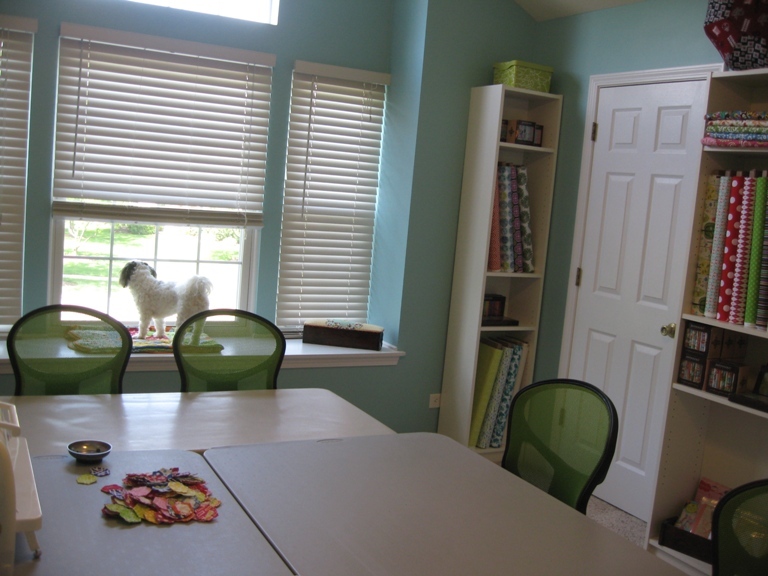 We painted the walls Robins Egg blue. 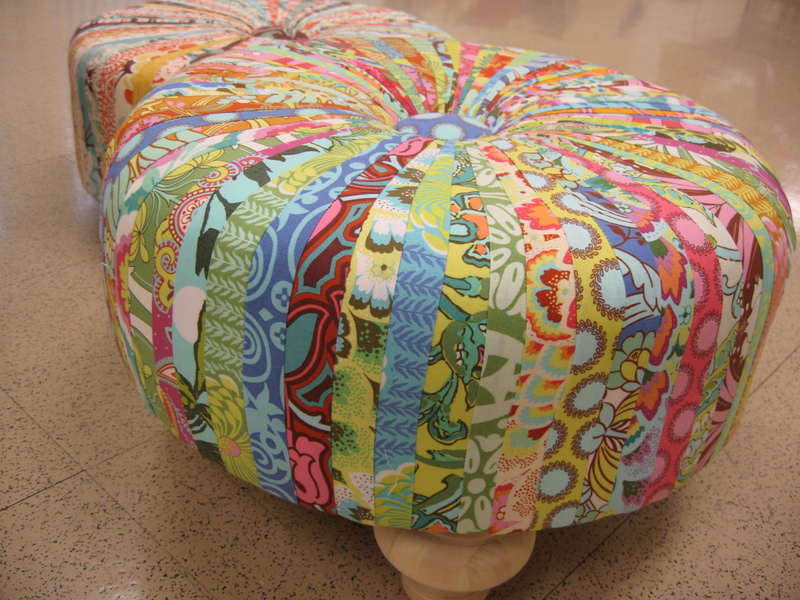 It’s so soothing and none of the fabrics seem to clash with it. They actually seem very happy in their new home. Ikea bookshelves were the perfect choice for storage. We had tables, but we needed seating. I found green chairs! They’re perfect. Enough seating for seven. I bought a kitchen cabinet from Home Depot and Nick attached a decorative top to it for the cutting surface. 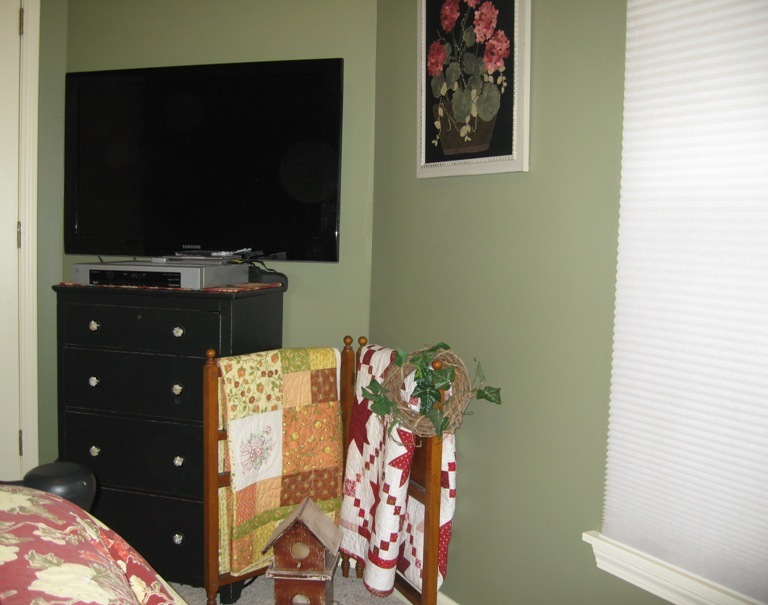 We took a peg board, painted it green, and attached a frame around it to fancy it up. 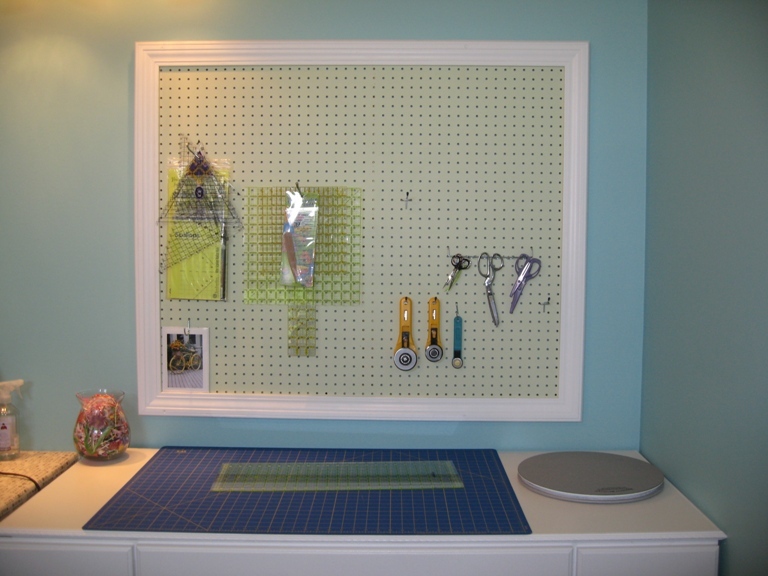 I can hang all the tools and rulers on it. I got that idea from Creative Little Daisy’s blog. 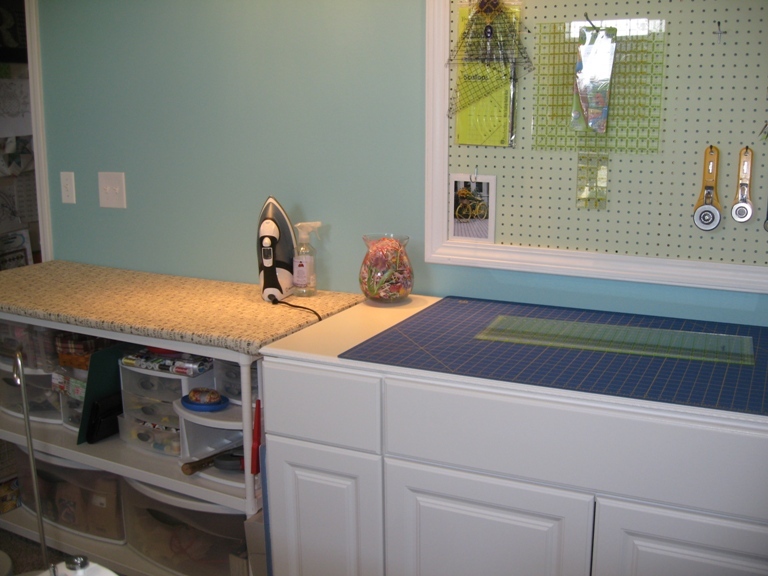 The ironing station stayed the same. And Daisy still has her perfect view. We didn’t stop there though. Our friends need may need to use the restroom and it deserves the same attention to detail. Don’t you love a pretty restroom? 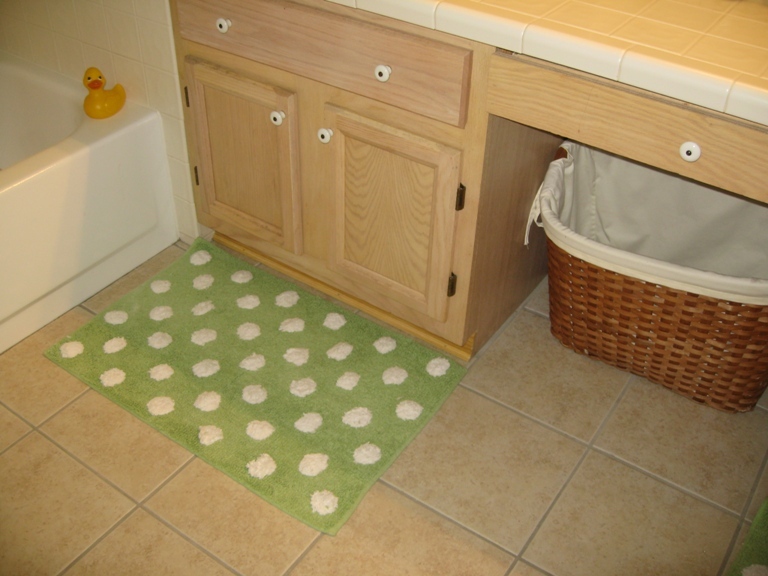 I found perfect whimsy bath mats..polka dots! 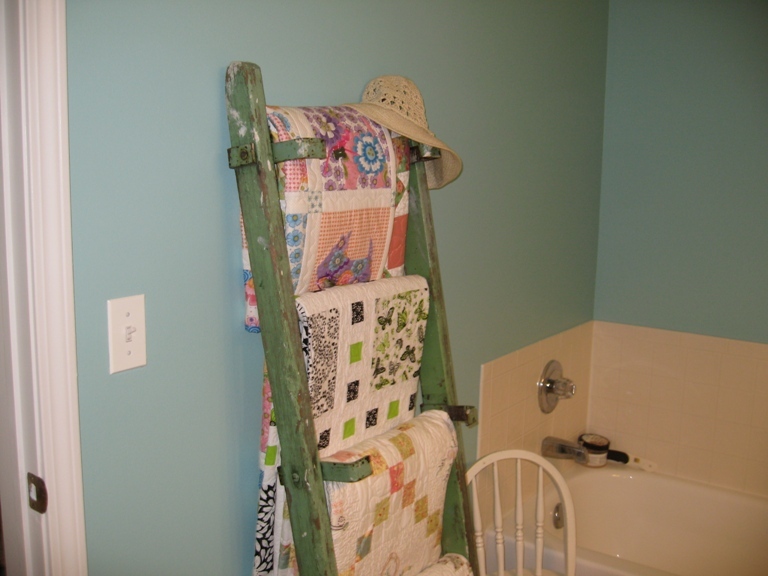 I moved the quilt rack in there. I like seeing them while I put my makeup on. It makes me happy. 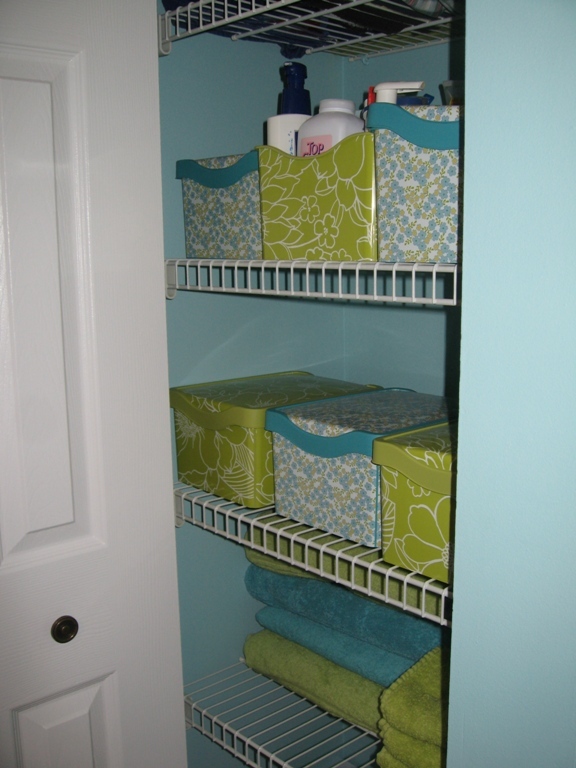 Ahhh…it feels so good to be organized:) Now it’s time to get to work! A special thanks to Fix It Nick who did all the hard work for me. I couldn’t have done it without him…seriously..thanks Nick, Paige and I LOVE it! 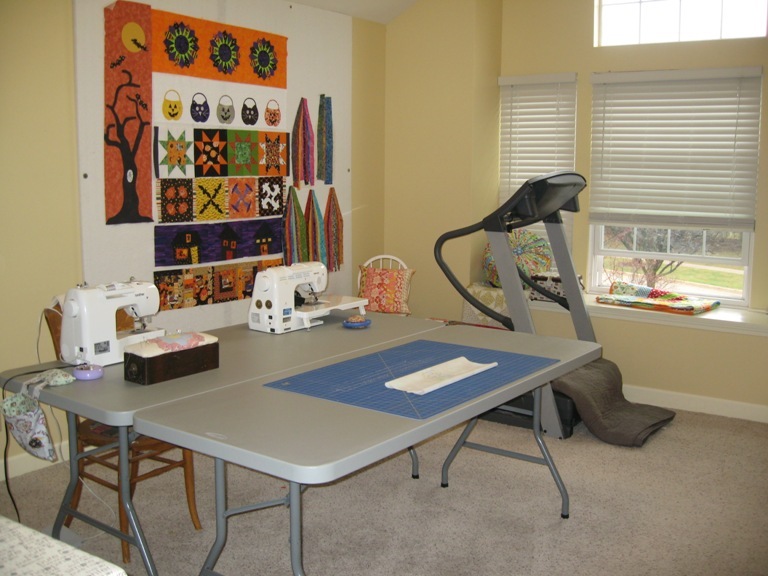 I soon discovered when Paige and I decided to do Etsy that I had out grown my small loft as my sewing space. I was in denial for quite awhile. 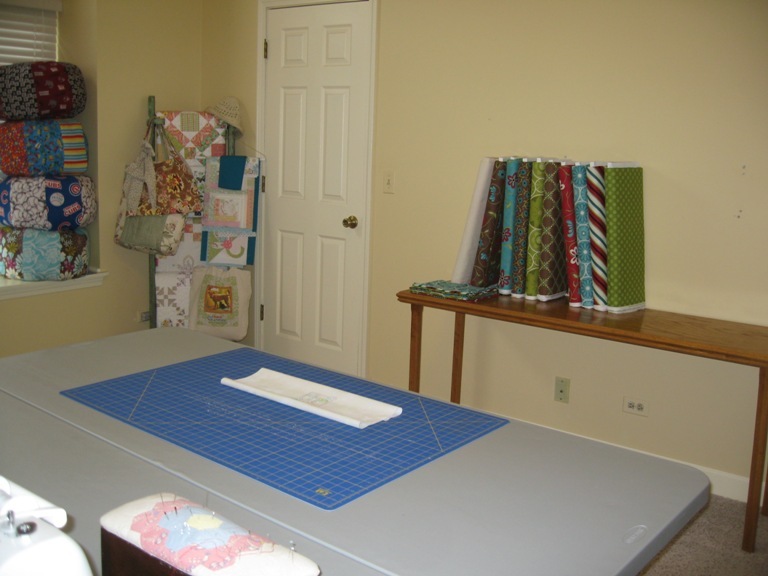 But as I was making the OU quilt it became apparent that I couldn’t sew a quilt that is actually bigger than the space I’m sewing in. So, I made the decision to turn my master bedroom into a studio. I hired my neighbor Nick to help me out with the project. First things first….the design wall. 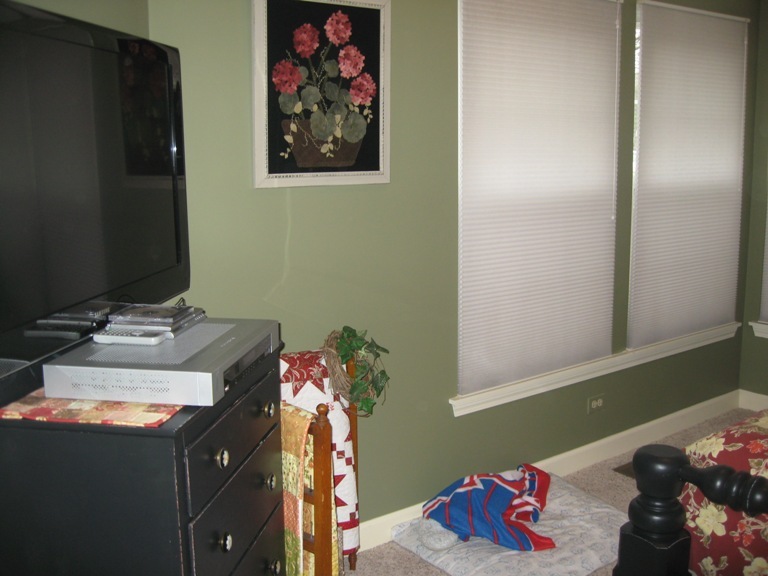 We removed all the furniture and hung a 8′ x 8′ design wall on the largest wall. It’s 2 4′ x’4′ insulation boards taped together and covered in batting and screwed into the wall. 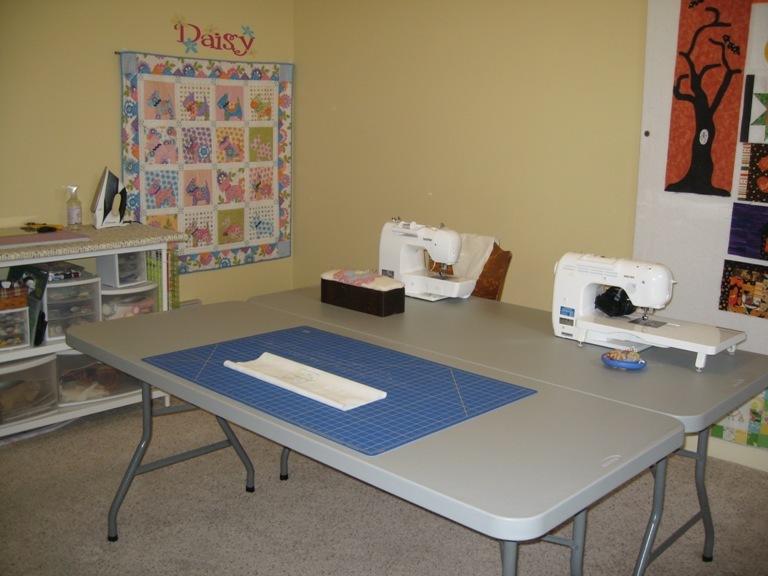 I bought 2 6′ tables for sewing. 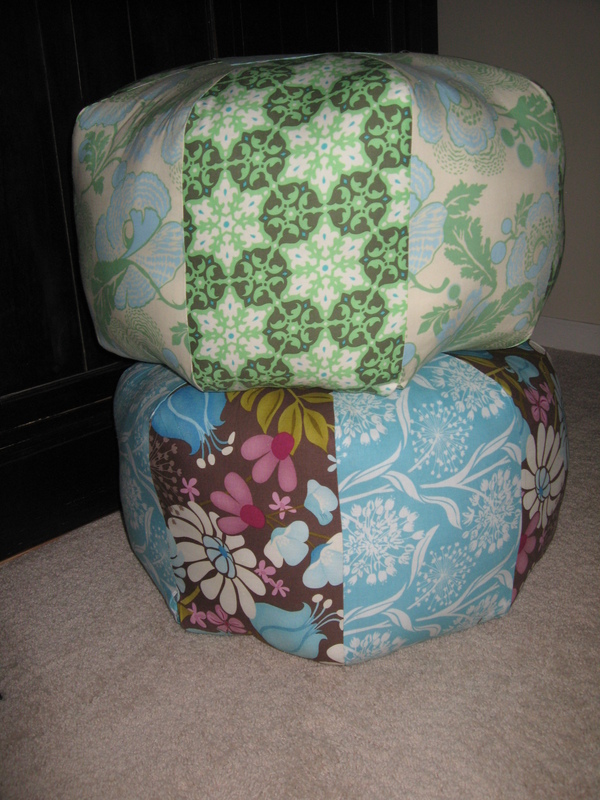 Now the SewMod girls won’t be squished around the kitchen table when we get together at my house. I still need to find some chairs for the tables. 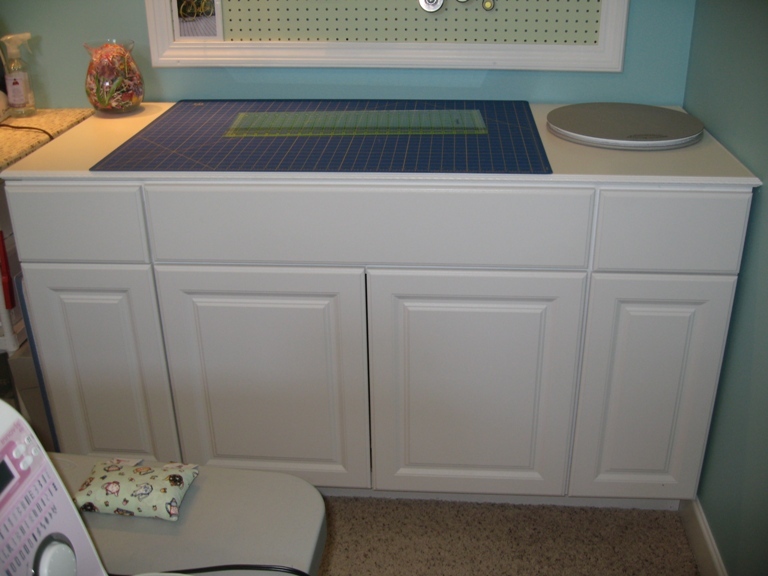 And when sewing machines aren’t occupying the table I can use it as an extra cutting space for the bolts. 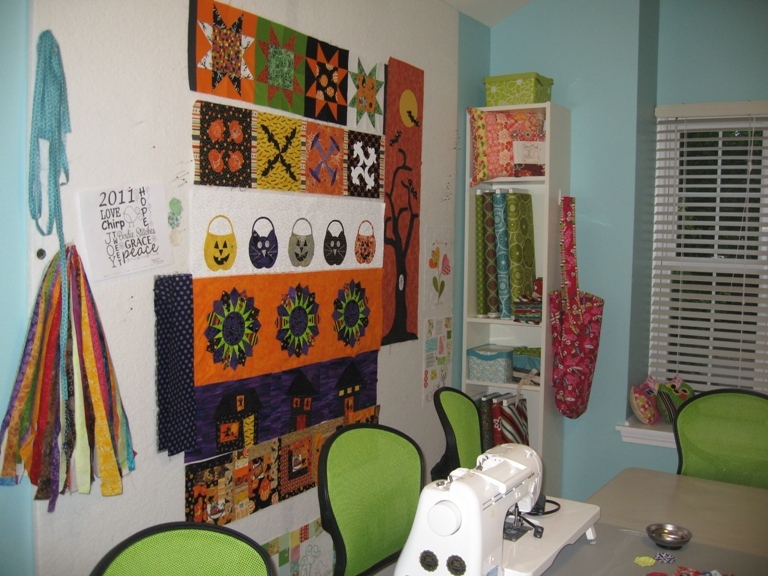 This wall will soon have bookshelves for the fabric that are coming in. I moved my dresser, which didn’t even have any clothes stored in it, onto the loft. 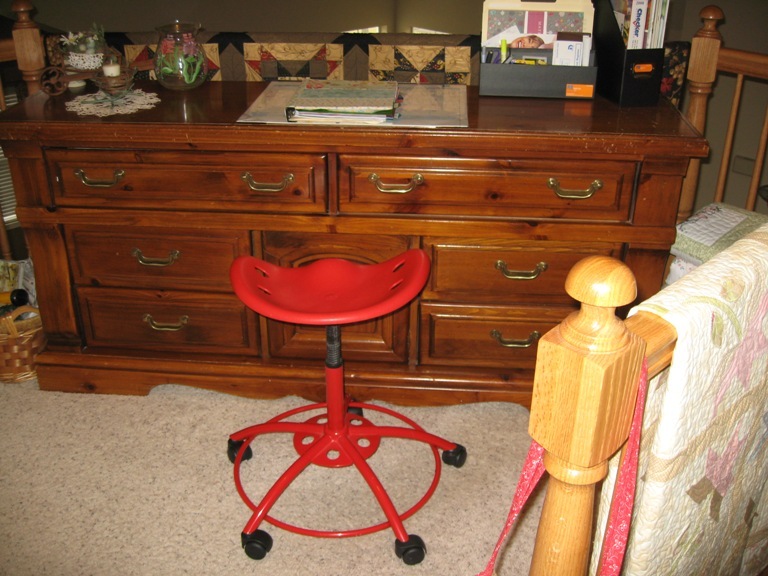 I’m using it as a desk for Etsy, designing, and storing some of the Etsy merchandise in. It fit so perfectly there. It was like it was meant for that space. And I’m definitely replacing that awful chair. I’m stalking something at Ikea:) Just haven’t committed yet. 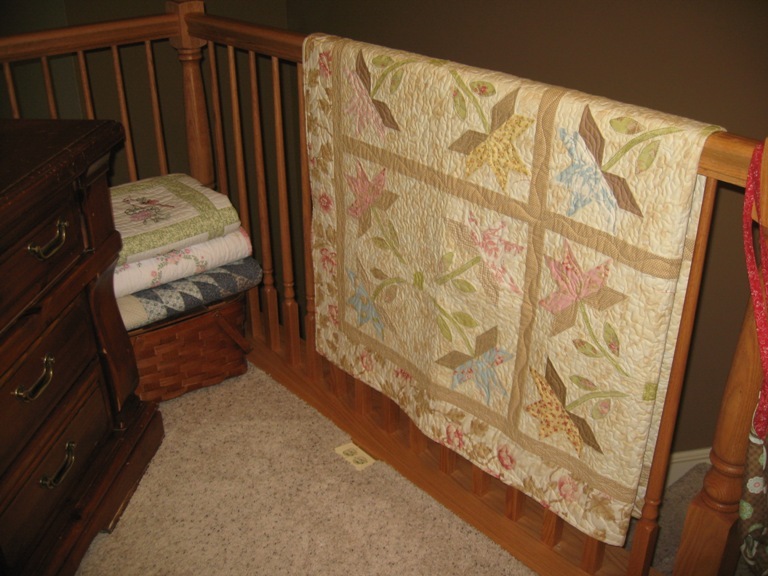 My Aviary quilt looks so awesome on the banister. Now my bedroom is downstairs in the tiny “office”. Iv’e adjusted pretty well. 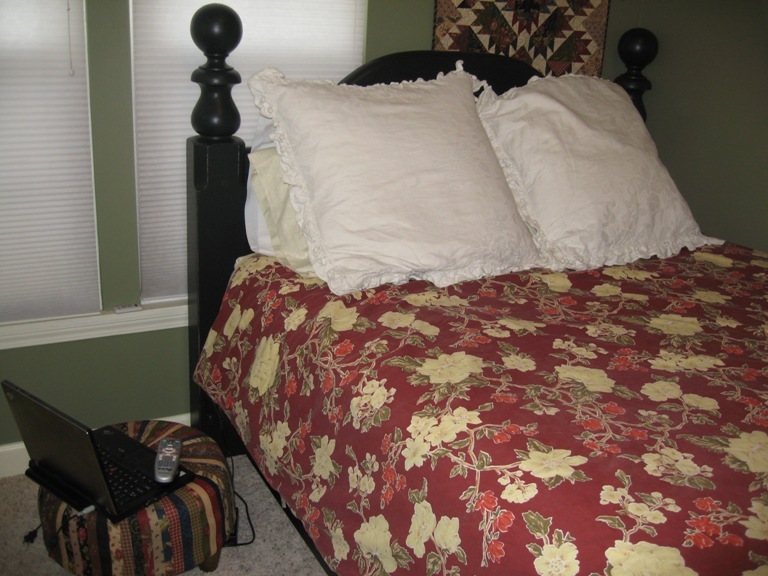 We painted my bed, which was the color of the dresser that’s on the loft, black, and I ruffed it up a bit to look worn. I think it turned out really nice. I wanted to that for some time now. I’m glad I went for it. 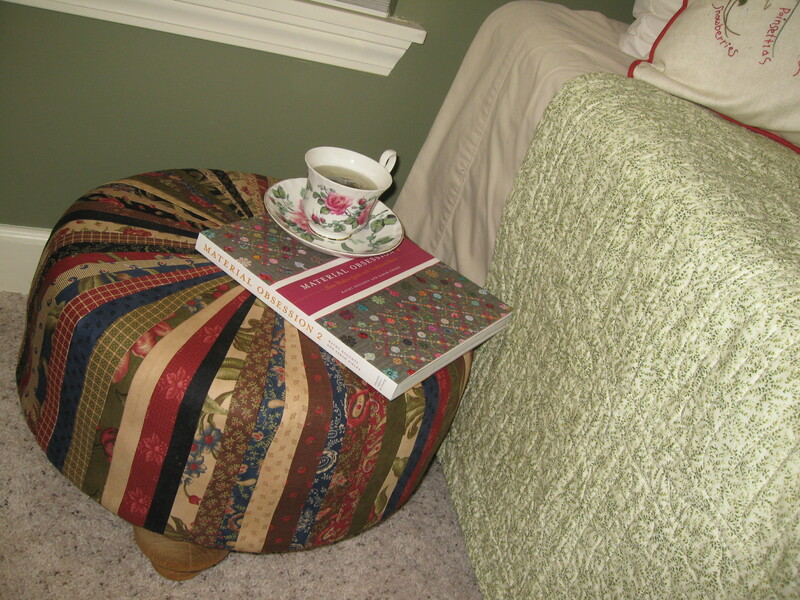 The tuffet is being used as my nightstand. 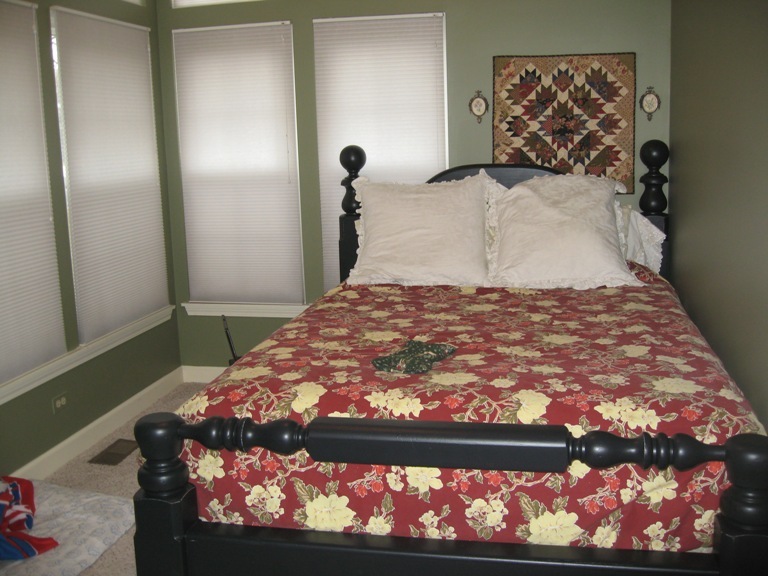 I even had room to display a few quilts. 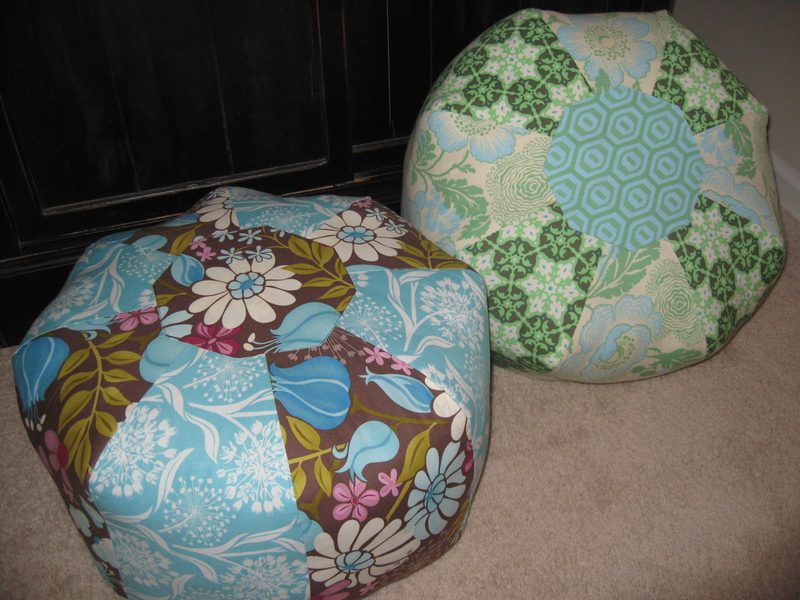 I think it’s time to have the girls over for a little sewing, don’t you? 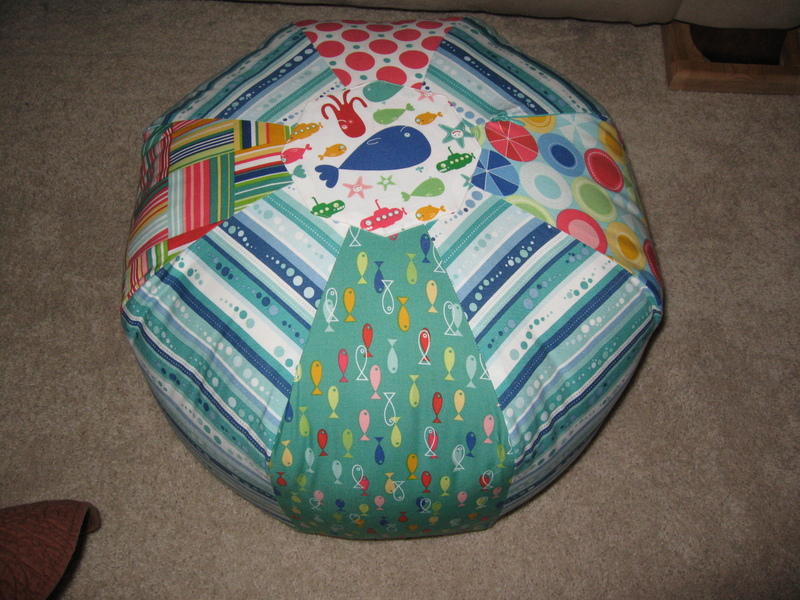 The SewMod Gumdrop Party was Sunday. We met at Vicki’s house and I wish I had taken a pic of the food bar she had set up where we each made our own calzone and sodas. Kelly brought chocolate chip cookies and Pattie brought gourmet chocolate cupcakes stuffed with marshmallows. I know, you’re hating on me right now for the lack of pics. I’m so sorry! We had a great time, as usual! Thanks Vicki for being a great hostess! Meet SuperCool Kelly. She made her gumdrop in a black and tan with a cute polka dot top. Vicki made a kids one for her nephew Kenny. And finally, mine and Paige’s. I used Central Park by Kate Spain and Paige used some calming green prints from her stash. I found hers to be very soothing colors. 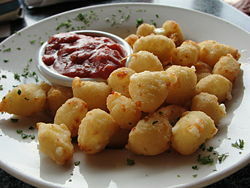 These were so easy to make! I’m definitely making more. I think maybe a Cubs one for Russell and an OU Sooners one for the Etsy shop. Wouldn’t that be a fun one! 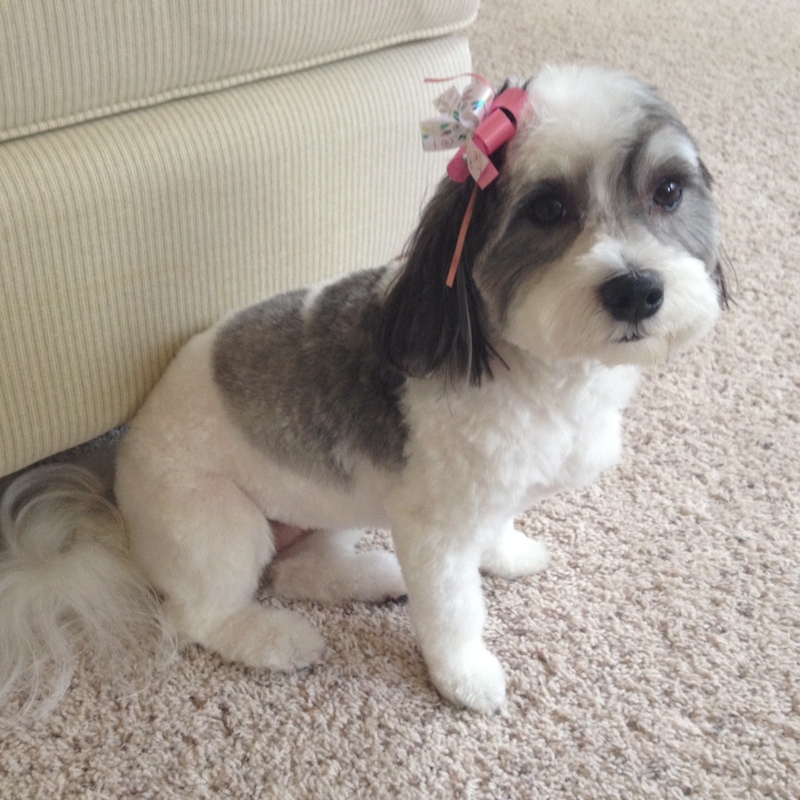 **UPDATE 6/12/2015 The Tuffet classes are Closed at this time. 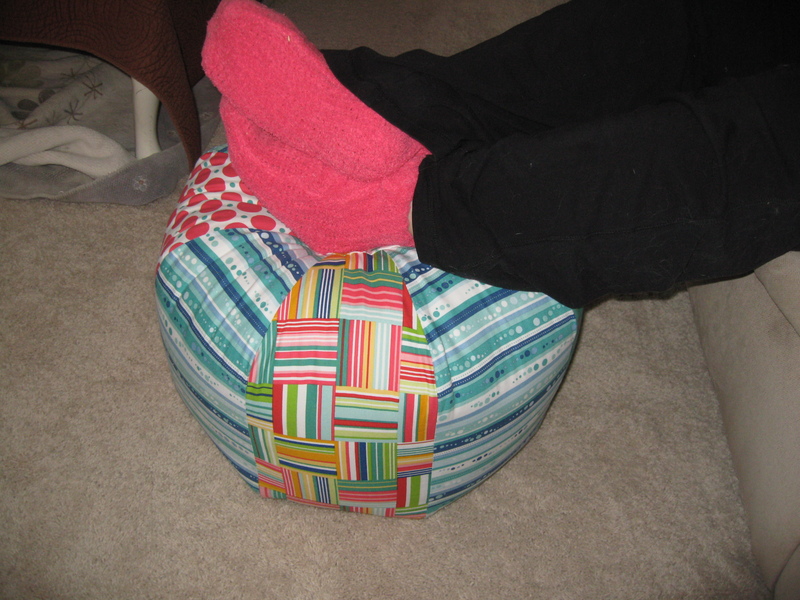 Paige finished her tuffet this week! 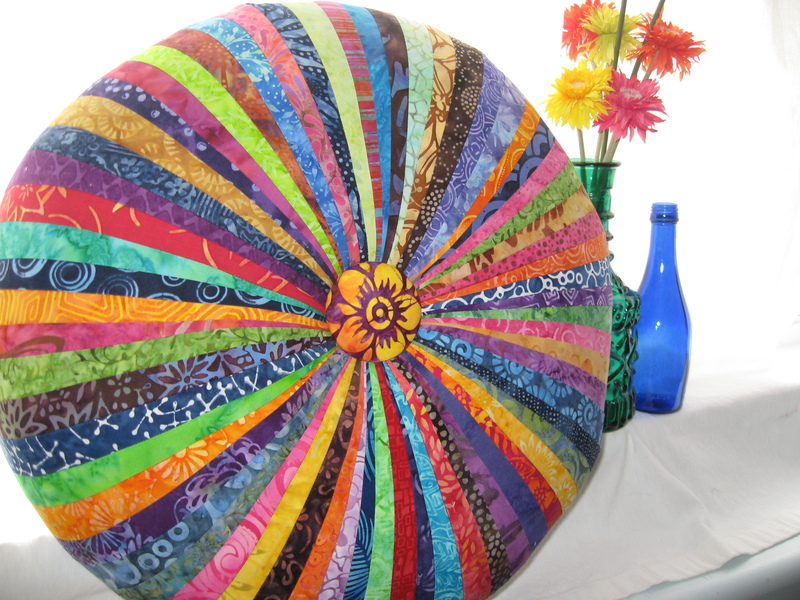 She used a full range of bright batiks. 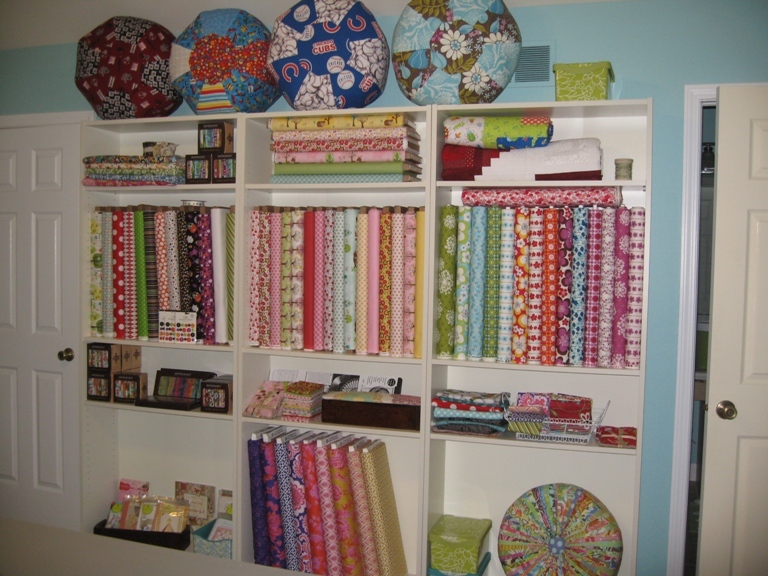 Can you believe that all 64 prints came from her stash! It looks like a jewel and I really love how she centered the flower batik as her button. 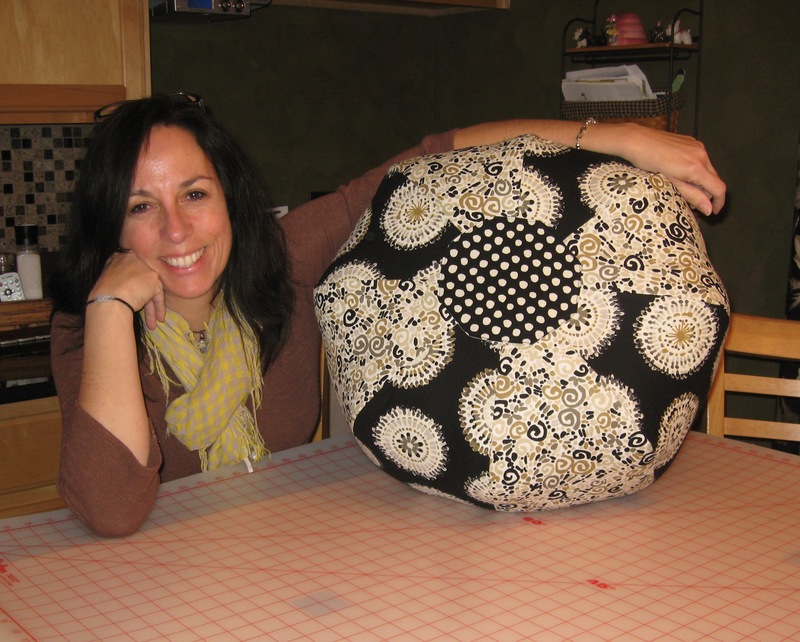 For all you lucky local residents of the Chicagoland area, SewMod is interested in holding a Tuffet Class using the pattern by Myra Mitchell. We were thinking a Saturday or Sunday in the month of May or June. We are flexible. If we get 3 or more interested then we will hold the class. 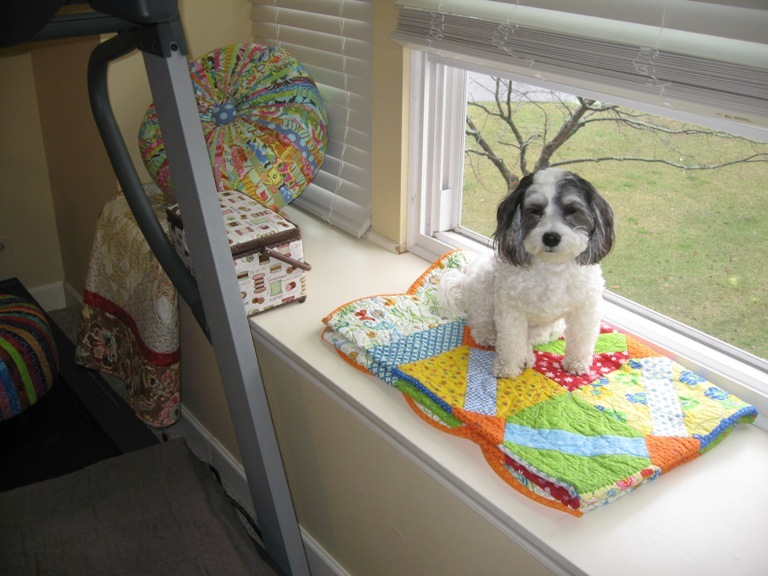 **Class requirements are intermediate sewing levels with knowledge of foundation or paper piecing. Please contact us below if you are interested in the class simply fill out the fields and clicking submit. Have a great weekend everyone! 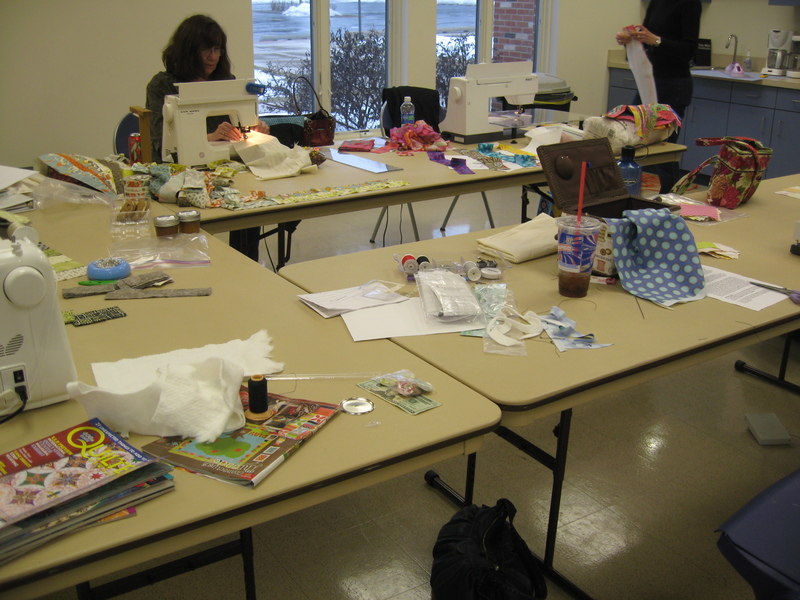 The tuffet party for the SewMod group was a success! We met on Sunday and I couldn’t be happier with how everyone’s turned out. Let’s start form the beginning, shall we. 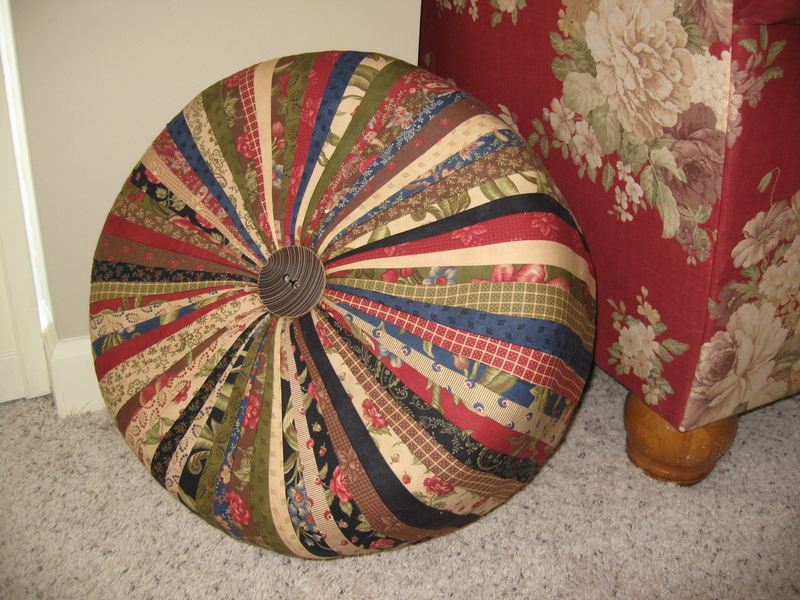 1st there are tuffet “cakes”, 6″ foam and heavy plywood, sprayed together with upholstery adhesive. 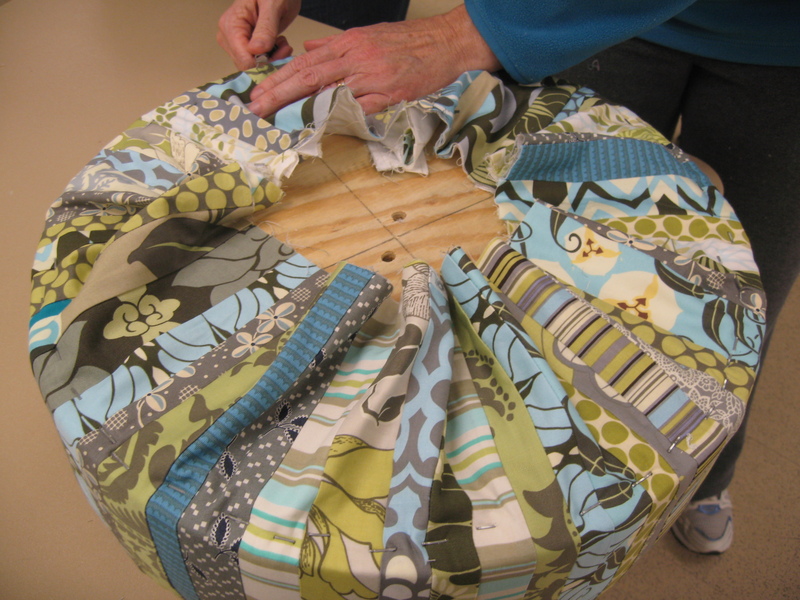 Jelly roll strips are foundation pieced onto muslin and sewn together. Cover the cakes and staple underneath. And if you work really, really hard…. 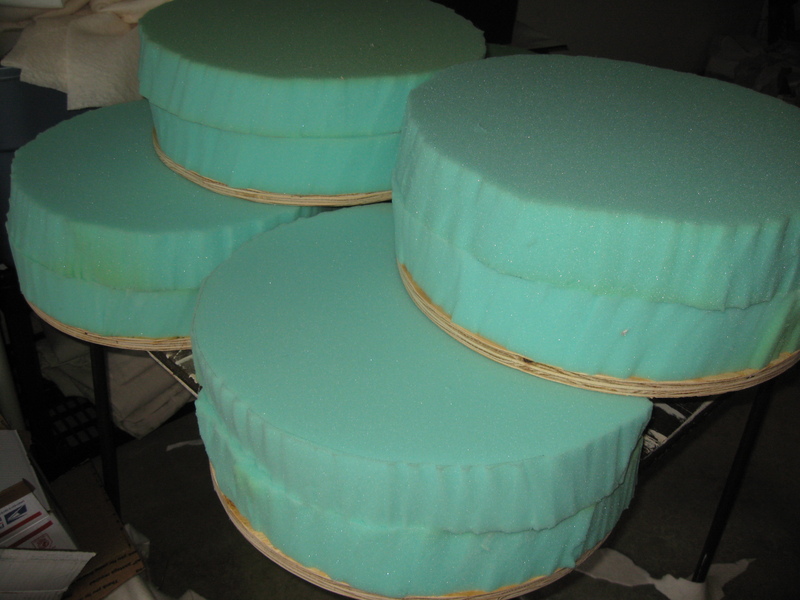 your cakes grow up to be tuffets. 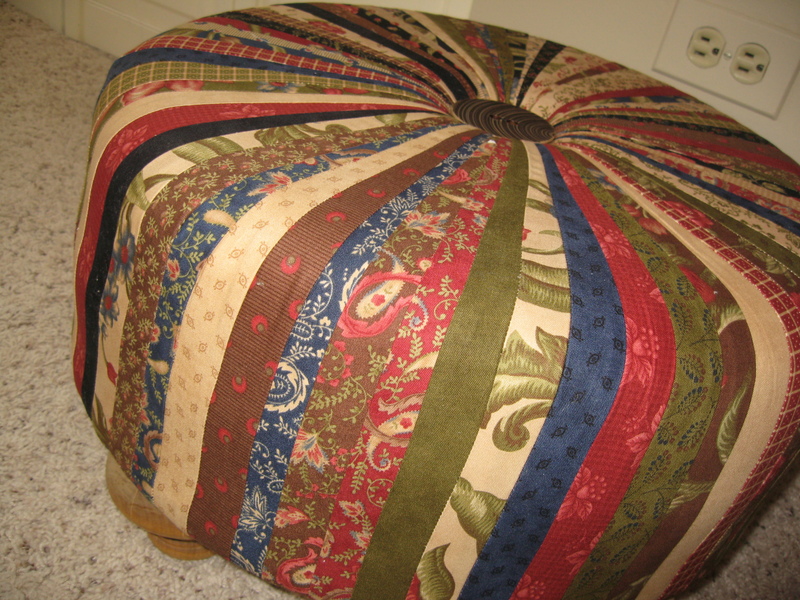 I used a Soul Blossom jelly roll on mine. I still need to paint my feet. I had a great time and I hope the other girls did too. 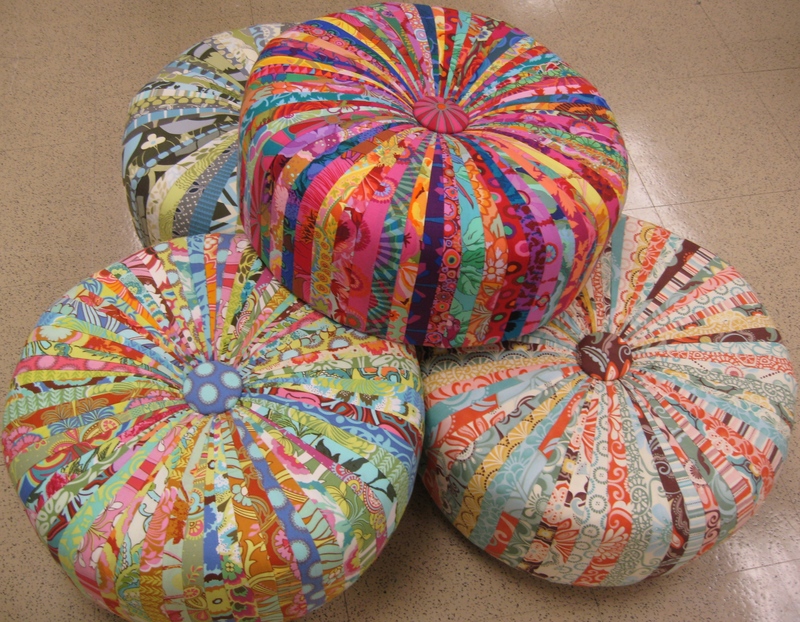 Vicki suggested trying the Amy Butler Gum Drop Pillows next. Sign me up Vicki. I’m in!